Eager recruits would borrow and scrape together as much as $15,000 apiece for a chance at one of the “guaranteed” jobs Mr. Bansal advertised for his employer clients. In recent years, those clients included such major fast-food franchises as Subway and Fatburger, as well as Best Western hotels and Mac’s convenience stores, among others. Many recruits made initial payments to Mr. Bansal overseas in Dubai or India, in cash, which his former assistant said he brought back to Canada in suitcases. Some waited months for job offers that never materialized. Others got to Canada but found the position they’d been promised didn’t exist. Mr. Bansal kept their money anyway, and, in some cases, went after them for more. It has made him a wealthy man. Along with his family, he now has a golf course, a banquet hall and at least $15-million worth of real estate, according to public records. Mr. Bansal is among the more notorious of the thousands of job recruiters and consultants operating both in Canada and abroad. A four-month Globe and Mail investigation probed 45 such agents, who together have amassed scores of complaints, lawsuits and charges against them in Ontario, British Columbia, Alberta and Quebec. Along with employers and career colleges who paid them to help fill their job openings and classrooms, they collectively stand accused of exploiting at least 2,300 people in recent years, from countries such as India, the Philippines, Mexico and Guatemala, for their money, their labour or both. The Globe conducted interviews with more than 80 people – foreign recruits, legal experts, migrant advocates and industry insiders – across Canada and abroad, and reviewed reams of lawsuits, formal complaints, investigative reports, government data and online ads. It is illegal to make anyone pay for a job in Canada. Even so, recruits of the 45 agents identified paid as much as $40,000 each – a fortune for most – in exchange for the often false promises of a decent job or a place in a career college. Such promises also frequently included the assurance of long-term work permits that, in turn, would lead to the ultimate prize: permanent residency in Canada. A look at the conditions where Mexican workers lived in a Barrie, Ont., home where they waited for shifts cleaning hotels. Twenty-eight to 30 people were crammed in small spaces, where there were bedbugs and not enough heat. 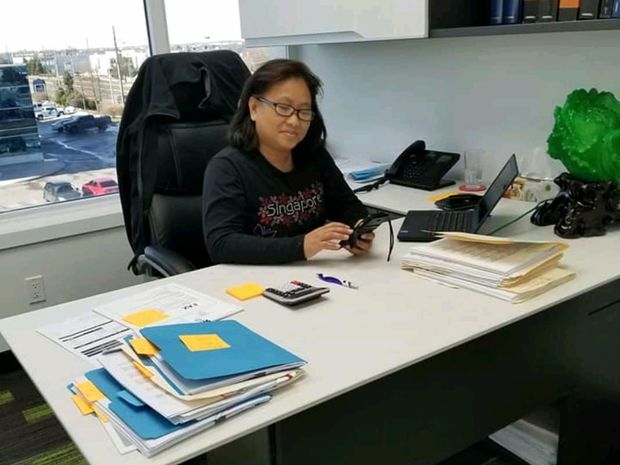 All the while, many of them remain at the mercy of the immigration consultants and job recruiters – with one person or company often filling both those roles. The agents speak the migrant’s native language, and often, as well, keep them on the hook by dangling another job offer or the promise of a visa, but only if they keep paying more fees. A key problem, according to people who see this repeatedly, is that the work visas are temporary and most allow migrants to work only for one designated employer. Because of that, those who are exploited can’t just seek out another better job on their own. Ottawa, meanwhile, has done nothing to stop the proliferation of unscrupulous international recruiters who continue to entice and mislead people into thinking Canada is a country with open arms and opportunities aplenty. The number of licensed immigration consultants has doubled to more than 5,000 in the past five years. They are subjected to a lack of government oversight, answering only to a national self-governing body. Enforcement is lacking. Federal figures obtained by The Globe show the number of leads that immigration authorities recorded about employment fraud by agents doubled in the last five years – from 153 to 301 – while, inexplicably, the number of investigations went down, to 27 from 38. “If the public were aware and really understood how the system operates to allow widespread exploitation and trafficking, they would be shocked,” Ms. Dalley said. Of the 200 investigations between 2014 and 2019, there were 29 convictions; 18 of those convicted served no time in jail. When pressed, consultants and recruiters will insist they aren’t charging money in exchange for jobs. However, several recruits told The Globe they would never pay the large sums just for visa applications. They pay, instead, for the promise of good work and a future in Canada, which often do not materialize. Some of Mr. Bansal’s former corporate clients are among those whose franchisees are still using immigration consultants to recruit workers. The Globe asked those companies why they were doing so, but only Fatburger responded. The fast-food chain said that it has “partnered with several" licensed consultants over the years, but that it now uses them to recruit foreign workers from the ranks of international students already in Canada, as opposed to recruiting overseas. Consultants also bill the employers and colleges seeking to recruit workers or students, which is legal. Mr. Bansal testified at a hearing over an employment-agency licence that Mac’s paid his company $100,000 for recruitment services over a two-year period. When consultants recruit foreign students for career colleges, they get a cut of as much as 25 per cent of the tuition those students pay. In Canada’s largest provinces, next to nothing has been done to rein this industry in. Mr. Bansal is still in business even though B.C. and Alberta have taken his employment-agency licences away. He has been charged with hiring foreign nationals illegally, has fought numerous court battles and is facing a class-action lawsuit from former recruits as well as a disciplinary hearing with the immigration-consultants’ regulator. He still has his immigration-consultant’s licence, however, and his Surrey, B.C., businesses are advertising job openings. Mr. Bansal declined The Globe’s request for an interview. Kuldeep Bansal's former assistant, Arjun Chaudhary, describes how his job involved posting "fake" ads online and calling overseas recruits who had paid Mr. Bansal's agency for a chance at work in Canada. International recruitment is big business, growing in lockstep with global migration. Last year, the federal government granted 340,220 temporary work permits. More than half restricted the migrant to working for one employer. It also issued 358,190 study permits. About a quarter of the work permits were issued to lesser-skilled workers under the temporary-foreign-worker program. Approvals for such recruits have dwindled in the wake of a controversy five years ago, when some employers were found not to be hiring enough Canadians. The federal government then put stricter limits on the number of low-skilled workers that employers could bring in under the program. Partly as a result of that crackdown, study permits – which allow people to work for any employer, for limited hours and only short-term – are the new hot seller for recruiters, who can then steer the students to low-skilled jobs with their employer clients. Last year, the federal government issued almost 40 per cent more study permits than it did in 2015. Major Canadian service-sector employers, corporate farms and career colleges use recruiters because they want migrants to fill jobs and classrooms but they don’t want to deal with the hassle and government paperwork involved. Recruitment agents have taken on so much of that function that several migrants who spoke to The Globe said most major businesses simply won’t hire or sponsor them directly. The main way for them to access jobs here is through recruiters. “When you come from some other country, you don’t know the rules,” Ms. Kaur said. She estimates she and her father have spent $60,000 on immigration consultants’ fees. “You go to the bank and deposit the money and get the money back in cash to give to the employer,” Ms. Kaur said. She estimates that she was left with $50 for each full-day shift. “Many people on a work permit,” she added, “are having to do that." Mr. Bansal’s former assistant, Mr. Chaudhary, says that such stories are not uncommon, and that the balance of power is stacked in the consultants’ favour. Mr. Bansal, he recalled, liked to keep job and visa applicants waiting in his reception area for hours. “It was a dog eat dog, because we had 50 people [who had paid] and 10 [jobs that had work-permit approvals], so we had to pick from out of those 50,” he said. “He would wear Armani pants, and all that, and make them wait outside." Mr. Chaudhary said that Mr. Bansal gave him two principal tasks: Post multiple job ads online (partly to attract yet more recruits), many for openings that didn’t exist; and phone jobless clients, who had already paid for Mr. Bansal’s services, to press for more payments from them. “His thing was to get more money, because what matters is how long the client is with you. If the person is on the hook longer, you make more money,” Mr. Chaudhary said. In lawsuits and formal complaints, Mr. Bansal and other consultants are also accused of threatening and intimidating people by telling them that, if they did not pay up, the consultant would sabotage their immigration applications. Mr. Chaudhary recalls that his employer was “confident he wouldn’t get caught, no matter what happens.” He alleges he was once called in to work by Mr. Bansal on a Sunday in 2015 to help technicians switch out company computers and scrub case files. Later that week, he said, immigration authorities and the Canada Revenue Agency raided the office. “Nothing came of it – because he knew beforehand what was happening,” Mr. Chaudhary said. He is convinced that Mr. Bansal was tipped off. Marisol Bobadilla, a Filipino migrant, cries as she recounts her experiences coming to Canada on a work permit. 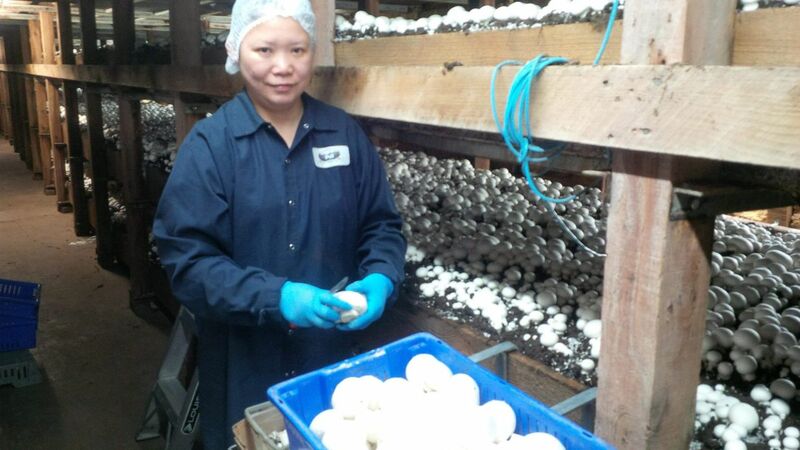 A provided photo shows Lourdes dela Pena at work on an Ontario mushroom farm, where she worked long hours for little pay, because a recruiter told her that would help her become a permanent resident in Canada. That never happened. Ms. dela Pena, Jessie Veneranda and Maila Ceguerra. They allege that they were strung along with little pay for their farm labour. 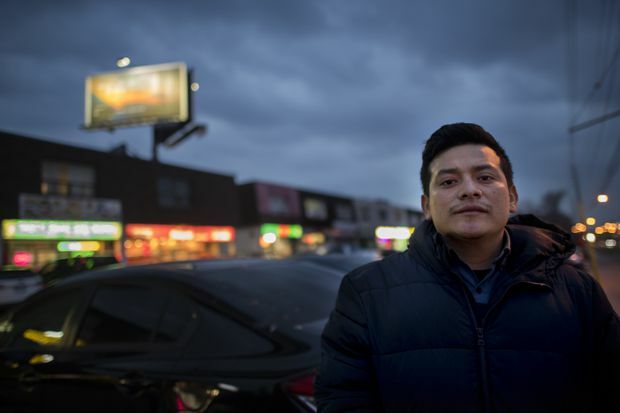 Link4staff, in Vaughan, Ont., north of Toronto, supplies workers for employers, while also charging recruits for “immigration services.” The agency has been listing jobs at gas stations, pizza restaurants and a mushroom farm. Marisol Bobadilla, one of the plaintiffs, said a driver picked them up every morning at 5 a.m., at a house Link4staff had arranged for some of them to stay in and took them to the farm, where they would pick mushrooms as long as it took to meet the farm’s requirements for the day. Ravine Mushroom Farms declined The Globe’s request for comment. 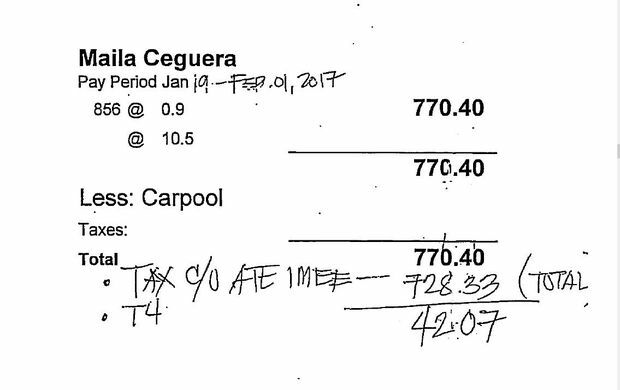 One of Maila Ceguerra's pay stubs appears to show nearly all of her pay being deducted in 'tax,' leaving her with $42.07. The workers claim that Link4staff took a total of $86,585 from them, illegally. They said the agency required them to authorize it to represent them with immigration authorities. It then refused to give them passwords to check their immigration files online, they said. Their lawsuits also claim the agency “forged” letters from the government to the recruits, giving updates on work-permit applications, which, the workers said, hadn’t even been submitted. Jeanett Moskito, director of Link4staff. There are no charges against any of the Link4staff principals. Another director, Murid Abbas Malik, is a licensed immigration consultant. Both Mr. Malik and Ms. Moskito declined The Globe’s request for an interview. Link4staff’s lawyer told The Globe its immigration agency is entirely separate from its employment agency, despite the two entities having the same name and a common director. David Myers said Link4staff is not saying its former workers are lying, but it denies documents were forged. He also said the workers agreed to – and even asked for – any expenses that were deducted from their pay. “Link4staff is as upset about bad apples [in the industry] as anyone else ... they would embrace regulatory changes,” Mr. Myers said. Iran Jasmine is one of the migrants who alleges she was kept in poor conditions working for a Barrie-based employer. Ms. Jasmine claims that Ms. Zuniga paid her nothing for her first week’s work because she complained about the conditions. “I was told those who behaved badly would not be given work the next day, so everyone was scared to say anything,” she said, adding she didn’t stay past that first week. Patricia Zuniga, shown with her husband. Several recruits told The Globe that Ms. Zuniga charged them rent to stay in overcrowded, filthy houses where they had to wait for work. He said he earned $200 to $300 a week “cleaning toilets” in the hotels. Mr. Vazquez said that Ms. Zuniga deducted costs for rent, food, transportation and the “right to work” from his pay, leaving him with $100 for a month’s work. Rodrigo Vazquez says his spot on the floor at a crowded house cost $600. No charges have yet been laid, however. And Mr. Barnum acknowledged that, in the meantime, there is nothing stopping Ms. Zuniga from leaving Canada with her profits. 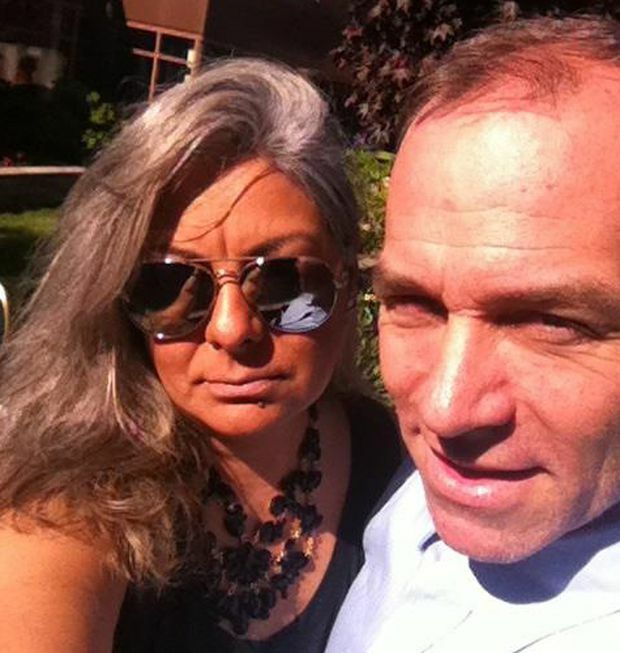 Through their criminal lawyer, Bruce Daley, both Ms. Zuniga and her husband, Kevin Kielty, declined The Globe’s request for an interview, but Mr. Daley emphasized that, if they are charged, they will plead not guilty. Westin Hotels & Resorts didn’t respond to The Globe’s request for comment. Edeline Agoncillo says she was promised Edmonton's Solomon College was a path to a work permit. She feels she was cheated. Some three dozen foreign workers and students, all in precarious situations, told The Globe they kept turning to recruiters and consultants for jobs and visas because they needed to keep working in Canada to pay back crippling loans they took out for recruitment fees and to support families back home. Another recruiter, still in business in Alberta, is accused in a lawsuit of misleading several clients into paying up to $18,000 each for a hospitality-management course at Solomon College in Edmonton, by promising that he would get them a three-year work permit when they graduated – which was never possible. “[Mr. Singh’s assistants] made it sound like I can also get an open work permit for my husband and I can get my children to come here to study for free. It sounded great,” said Ms. Agoncillo, who added that her parents mortgaged their home in the Philippines to lend her the money. Solomon is one of many private colleges in Canada whose graduates don’t qualify for long-term work permits, unlike those with public-college degrees. Many immigration consultants promote those career colleges, anyway, to get their cut of the tuition. Mr. Singh did not respond to The Globe’s request for comment. In a statement, Solomon said it makes no promises to students about getting work visas. Jonah Falgui is another graduate who says a consultant talked her into attending Solomon. She borrowed more than $25,000 for fees, plus tuition, after coming to Canada; that amounts to five years’ average salary in the Philippines. Documents show that the high-risk lender charged her more than 30-per-cent annual interest. “Working here is the only thing that can help me pay this loan. If I was sent back to the Philippines, I cannot afford to pay it,” Ms. Falgui said. “I am not optimistic about having a good future here any more." Jonah Falgui also came to Canada to study at Solomon.